Will The Unresolved Issues Of 2017 Explode In 2018? AI is already becoming a hot button in the service industry. AI is being leveraged to handle initial triage in IT support and auto-routing of requests based on entire text and not just a tag or filter. The age of the consumer is creating many challenges for the more traditional support organizations taking requests via phone or email. The consumer has expectations of experience and forward-thinking companies will deploy technology that enables this experience. Think Amazon, Walmart or your favorite music download site. Restoring trust is going to be a big issue in 2017. Many organizations have failed to meet basic customer expectations. Brands across all industries are going to have to work hard to restore trust with the everyday consumer. We live in a world where disposable incomes continue to be challenged on an annual basis. Consumers will continue to look for brands that offer the best value for money for the ‘end to end’ experience. That includes how much it costs to deal with things when they go wrong. An increase in interest and investments in emerging technologies, such as chatbots, that help to improve the effectiveness and efficiency of providing top-notch yet cost-effective customer support. Along with this will be a greater focus on providing mobile-based support interactions. A continuation of the interest in and adoption of a greater focus on employee engagement. This will translate into more companies providing agents with the information and tools they need to resolve customers’ issues without escalation, as well as investing in more training and career development. The shift to self-service will accelerate. Simple straightforward calls and contacts will increasingly be served by self-service solutions including, mobile, web, IVR and chatbots etc. This shift of ‘easy’ calls to self-service, will leave the remaining contacts as challenging and difficult. 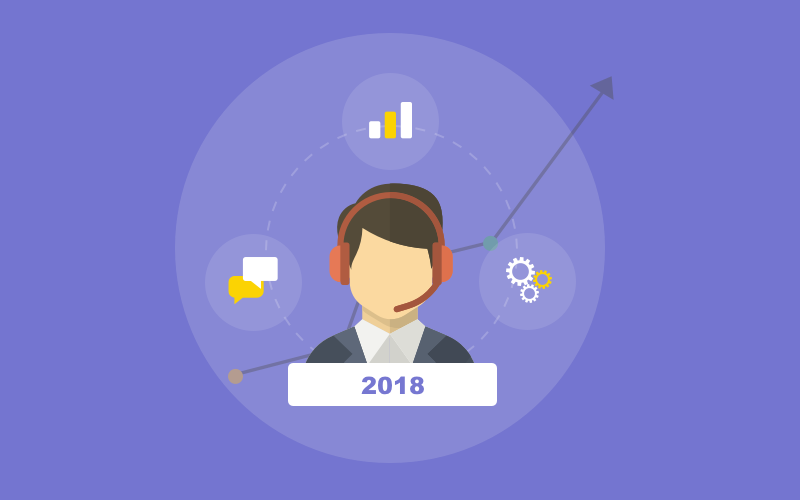 The agent skill and proficiency requirements to effectively manage these contacts will eliminate many agents who may be working in contact centers. This shift is also likely to see wages rise for these ‘super-agents’, and training and skill development budgets increase, as organizations respond to the need for enhanced skills and capabilities to solve advanced and complex customer challenges. All departments must have the same access to customer information and contact history. Sales should not be asking the customer during a check-in call, “So how is everything?” when the customer has already called support several times. Databases will need to be more robust to capture all communication between an individual customer and company. Let’s look at some of the major events that have occurred in 2017. Hurricane Irma thrashes the Caribbean. Las Vegas mass shooting leaves many unanswered questions. We will go into this topic later. Hurricane Harvey lashes Texas. It is an unprecedented event, with overwhelming flooding. Puerto Rico devastated after Hurricane Maria, and there are remaining issues there yet to be resolved. President Trump has dealt with so many issues, but one very brave act he accomplished was standing up to the United Nations by delivering a harsh message to world leaders. He warned them that the United States may have to “totally destroy” North Korea if it continues on its current path. He also criticized China, also rebuking Russia, condemned Venezuela’s government, and suggested he might scrap the Iran nuclear deal. Also, he very brazenly cut the UN budget, putting the citizen taxpayer of the United States first. What promises did President Trump keep in 2017? He kept so many, and those many were very important to the United States of America. He promised to “bomb the hell out of ISIS.” He kept that promise, but no one ever gives me credit for it. Remember all the beheadings? The Iraqi Prime Minister declared Iraq “fully liberated” from ISIS. Trump hit ISIS hard, and it has paid off. Trump pulled America out of the 12-nation TPP agreement. Obama signed the agreement, and even Hillary Clinton expressed doubts about it. Trump vowed to “cancel” the Paris climate accord, which was ratified in October 2016, giving it the force of international law, and in June 2017 announced he would withdraw the United States from the now 197-country agreement to reduce carbon emissions. “We’re getting out,” he said. Of course the accord continues to exist, even without the official support of the world’s second-largest source of carbon emissions. And because the climate accord was ratified just days before Trump won election, the process of withdrawing from it is no simple matter: It will take four years and only become final shortly before the 2020 election. Nonetheless, Trump took all the steps he could to free the US from this Accord. Trump overhauled the tax system. Trump got the individual-mandate penalty for not carrying health insurance, which was legally permitted as a form of taxation by the US Supreme Court, repealed in the tax bill passed on December 20. Lets talk about the Las Vegas massacre. The following video is the best I have found which answers many of the questions I had about the tragedy. There are some new theories which I believe to be valid. It is believed there were multiple helicopters used during the attack on the Route 91 music festival in Las Vegas that left 58 dead and over 500 injured. Could a cover-up involve the fact that helicopter “gunships” fired down into the crowd of concert goers while other shooters conducted attacks on the ground as reported by 5 different witnesses? I believe this to be true. “Intellihub’s Shepard Ambellas was first to present the ‘helicopter theory’ on a major news outlet when he broke the news on The Alex Jones Show Halloween day. During the broadcast, Ambellas reported that helicopters were likely used some type of advanced air assault onto crowd goers. Here is the story from Intellihub.com by Shepard Ambellas, and he must be given so much credit on his research. I believe this is accurate. What if the entire Oct. 1 operation was conducted via an advanced air assault? Flight records show it could be likely? Flight records indicate that three Airbus EC130 helicopters registered to Mustang Leasing LLC (N-numbers N854MH, N848MH, and N858MH) departed from the vicinity of 6075 S Las Vegas Blvd between 9:40 and 9:41 p.m. on Oct. 1. After their departure, the three choppers flew to the north through the city in a tight line formation before circling back to the south where they abruptly stopped and hovered directly over the Mandalay Bay/Delano property 7-minutes later. In fact, N848MH hovered directly over a portion of Mandalay Bay’s rooftop just to the west of the Events Center Bar for several minutes (between 9:48 and 9:50 p.m.) before all three aircraft transponders went dark right at 9:50 p.m., just 15-minutes before the shooting started. In theory, the choppers would each have had to offload two assailants (a total of six). Two of which would have taken sniper positions right away (one on the lower north roof under Stephen Paddock’s room and one on the northeast corner of the Convention Center roof) while the other element of four stormed the casino floor, making their entrance through the parking garage. The three choppers (N854MH, N848MH, and N858MH) would have had to hold there positions or stay in close proximity to the Mandalay Bay for the next twenty minutes until all of the ended at 10:15 p.m. That’s when the two snipers would have made their EXFIL off the roof via chopper and returned to base with all three craft approximately three-minutes later around 10:18 – 10:19 p.m.
Hypothetically, the following image depicts what the shooters in the helos would have seen from their aerial positions as the three aircraft maintained a flat hover. The assailants would have been firing unmounted M-249 belt-fed SAWs due to the fact that mounted weapons would have been too hard for the three choppers to hide from law enforcement if an encounter were to occur upon their approach or getaway. According to the data, “SWA4119” was originally scheduled to depart Tulsa (TUL) at 14:10 (2:10 p.m. PDT) and arrive in Las Vegas (LAS) at 15:00 (3:00 p.m. PDT) but was somehow delayed for over 7-hours giving “SWA4119” a new arrival time of 22:22 (10:22 p.m. PDT) which doesn’t make sense because the craft was headed north and was too close to the airport to be aligned with any of the runaways at the time. Some new news I want to speak about is I just read that James Comey met with Robert Mueller before his testimony on Capitol Hill. This reminds me very much of the fact that Donna Brazile gave Hillary Clinton the questions before her Presidential debate with President Trump. This only adds more fuel to the fire to the pile of lies told by those associated with the Trump witch hunt. How much longer will this last, and how much more are the American people expected to take sitting down? 2017 has been a tough year for President Trump and those who honestly voted him into office. We The People spoke, but the Deep State did not listen . I imagine it will continue, but I dare not even speculate how long, or how it might end. President Trump is doing everything he can to get the bad guys, and he has given this Country much hope in moving ahead into the year 2018. May you and yours find the path easier to walk in the New Year ahead. God bless America.